Effective meetings. They are an essential staple for any successful business or organization. However, for many top companies, poorly strategized meetings have become one of the worst factors contributing to business waste issues that span the globe. It’s snowballed into billions of wasted dollars every year and left millions of employees disgruntled about the quality of their work-life. 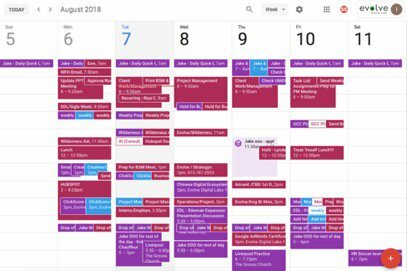 Has your work calendar ever looked like this? Of course, it has. Anyone and everyone in the business world has spent what they felt like the entire day inside conference rooms discussing client after client or issue after issue. But, once your employees leave to actually go accomplish their work, they don’t exit the meeting with a sense of clarity. Most depart with a sense of hopelessness, wondering how they’re going to get the work done and solve the issues discussed in the meetings. The problem doesn’t end there, however. On the project management side, your organization has just minimized the time your employees have to complete their work, as well as having spent clients’ money accomplishing nothing. From executive-level meetings that are designed to discuss your company’s goals, strategy, and projections for growth, to lower-level meetings that are designed to designate tasks. They all waste valuable time and money and there are very few organizations that seem to be innovating the process of running more effective meetings. Businesses continue to hold meetings their way, the familiar way, the way that continues to lead to billions in business waste, missed deadlines, and underperforming work. With the multitude of advancements in technology over the last five years, you’d think that every organization would be using A.I. and machine learning to hold more effective meetings. Until now. We did, and the results will lead to almost $1,000,000 in savings for our company and our clients. Now, let us preface, we don’t think meetings are some evil work process. This isn’t a bash meetings piece. Vocal communication is essential to success. The problem is, meetings aren’t strategized correctly. Evolve’s CEO came to the realization that these exact issues were beginning to plague our organization. His time, as well as many other employees was being spent in meeting after meeting, leaving them little-to-no time to actually innovate our organization or our client’s businesses. Seeing as we’re a predictive analysis based marketing agency, he called upon our business solutions team to use advanced data-science practices to pinpoint our company’s meeting issues. Then, from those findings, devise a strategy and framework that would eliminate our meeting waste so we can increase client’s profits and the quality of our work. Before presenting our data-science case study around Evolve’s meeting effectiveness growth, I first want to give you a bit of perspective into our organization. As a digital marketing and business innovation company, we are growing at a fairly substantial rate in two aspects, new clients, and new employees. So, with that increase in business, our project management team pinpointed growing pains that attributed towards this profit loss and meeting effectiveness problem. This, of course, progressed into two additional problems. Our intra-agency meeting budget was increasing with the surge of time spent inside meetings. But, more importantly, our employees were finding less time to accomplish their tasks, which transformed into an increase in our paid media departments overspend and underspend percentages. We had to do something to end this business waste. Our business solutions team proposed some key requirements in order to make meetings more effective and solve our business waste issue. With the addition of Teem, an A.I. based project management software that calculates workplace analytics, we were able to successfully track and optimize every meeting that took place over the course of April, May, June, and July. Our business solutions team then studied how effective the meetings became, and most importantly, how our improvements in meetings were minimizing Evolve’s and our client’s business waste. The “Effective Meetings” Results Are In. Business Waste Issue Solved. However, after implementing our new meeting guidelines and utilizing the Teem software our organization saw some incredible changes forming. These innovations are astounding. Now, as an organization, we’re officially optimizing our businesses most valuable resource, us, the employees, and it was a driven-business solutions team and data science that helped us get there. If you view the chart above, you’ll notice our account overspend and underspend issues have been resolved and it’s simultaneous to the consistency in our average meeting duration decreasing. This proves that when a data-driven mindset is placed behind project management and business solutions it will produce more effective meetings that lead to less business waste for your company and for your clients. Every industry and organization deals with business waste due to running ineffective meetings. But, if your business truly takes the time to strategize your meetings and utilize the advanced technologies that are available, you too will be able to decrease your weekly amount of meetings as well as the time your employees are spending inside them and increase profits along the way. If your organization is still shaking its head over how to hold more effective meetings and how you can use data science so your business and clients can reduce business waste, reach out to Evolve Digital Labs for your free consult.